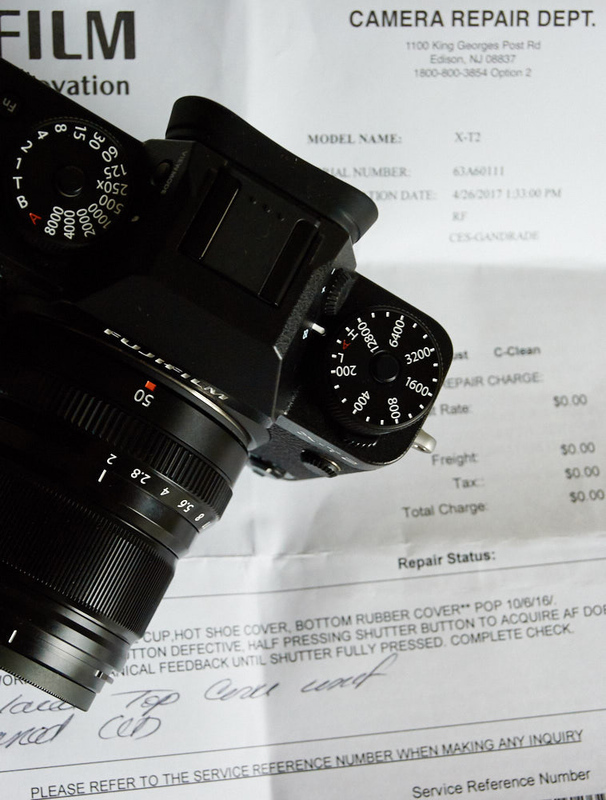 Fuji gets so many things right,had an issue with the haptic feedback on the shutter button on one of my X-T2 bodies, filled out the online repair form, mailed it in on April 24th, it arrived at the repair center on April 25th, took one day to show up in Fuji’s repair tracking system, received an email on May 1st with the tracking#, problem fixed, repaired & total cleaning. Now that is insanely fast, 4 days. Kudos to Fuji and a big THANK YOU! aye, good luck with this, Marco! I’m still waiting an answer from Fuji. The shop manager where I bought the camera is trying to push Fuji Italia to found a solution. They bought from Fuji a lot of cameras gear because their shop is one of the most famous of the Milan area, so I hope that their world will be more stronger and with more impact of mine. The shop manager ask me to wait until half of next week, then they will try an other way to repair my camera. I’m really frustrated by this experience. It is really a shame. Did Fujifilm pay for your shipping and did they provide you the shipping package? Unfortunately I can not say the same regarding the Fujifilm distributor here in Italy. I have an open issue with them for my new X-T2 and the 18-135. The camera has problem with the autofocus and the Fujifilm makes me problems because I have not the box of the lens. Until now I’m waiting an answer if they can accept to check my camera or not. All the material are under guarantees and bought as original Fuji Italy, not import materials. It is really a shame. Also the shop still have a problem to receive an answer from Fuji. I will never bought again Fuji and I will suggest to all my friend to buy other brand. If you don’t believe in my word I can demonstrate the claims with a lot of emails. I purchased both the 55-200 and 23f1.4 together. Both had issues straight out of the box. 55-200 was soft throughout the left side of the frame above 100mm, 23 had a loose focus servo. Both lenses have been in service 4 times for over 21 days avg. Last attempt the 23 came back with the focus ring jammed in a position well beyond the infinity stop. Some good some bad, we all get a different FUJI experience. But I do love the rest of my kit! I had the polar opposite experience. Took a total of 2 months, and they were “unable” to find the faulty pixel in my LCD, despite picture/email confirmation of the issue. I got sick of dealing with them, so I’ve decided to not send in the camera a third time. Really wish I had your kind of experience haha. Hi John, half pressing the shutter stopped working, I couldn’t focus and couldn’t evaluate exposure, only release the shutter. The camera got a full cleaning and it appears Fuji replaced the shutter button, on/off switch is much tighter now. What issues were you having with the XT-2 shutter release? My X-Pro2 shutter release has a bit of “play” in it. Kind of annoying but, I’m not really sure if this is just the design or if it’s faulty.